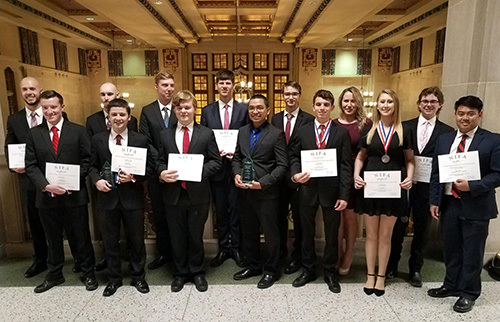 The Lewis University Flight Team advanced to the national level competition for the 10th consecutive year by taking third place at the NIFA Region VIII SAFECON 2018 competition. The NIFA Region VIII SAFECON 2018 competition was held Oct. 9-13 at Purdue University in West Lafayette, Ind. In addition to Lewis University’s team winning a Judges Trophy, several Flight Team members earned individual awards. Noah Ambroziak took second place and Will Kraatz took third in the Aircraft Preflight Inspection Ranking. Jane Zieba ranked seventh in the Top Pilot Award competition. Will Kraatz (drop master) and Danny Radz (pilot) earned fourth place in the Message Drop Ranking. Radz (pilot) and Kraatz (safety observer) earned second place, followed by Zieba (pilot) and Lucas Mickelson (safety observer) placing third in the Unlimited Navigation Ranking. The Lewis University flight team members include Noah Ambroziak of West Dundee, Mike Higgins of Homer Glen, Will Kraatz of St. Louis, Mo., Lucas Mickelson of Ridgeland, Wis., Chanon Penvari of Aurora, Jane Zieba of Orland Park, Danny Radz of Frankfort, Ethan Kurtz of Bloomingdale, Zach Davies of Dousman, Wisc., Thomas Buell of New Lenox, Franco Trujillo of Rockford, Gage Brown of Gurnee, Ansis Borg of Slinger, Wisc., and Taylor Klein of Brookfield. The coaches of the flight team include Calvin Warren, Jane Zieba, Lucas Mickelson, Will Kraatz and Geoff Culloton. Lewis University offers undergraduate degrees in Aviation & Aerospace Technology, Aviation Administration, Aviation Maintenance Management, Air Traffic Control Management, Aviation Security, Aviation Flight Management, Transportation Administration and Unmanned Aircraft Systems. The university also offers a graduate degree in Aviation Transportation on campus or online. Comments submitted to www.Lewisu.edu are posted to the News and Events article with name that is submitted. Lewis University reserves the right to delete comments. Offensive language, personal attacks or irrelevant comments may be deleted/and or not posted. Comments will not appear immediately. Thank you for your patience.